Friday, DPSCD’s Fisher Magnet Upper Academy and the Flying Classroom in partnership with the Ford Motor Company Fund hosted STEMFest to expose students to science, technology, engineering and math via projects developed by the districts Career and Technical Education program. “Ford recognizes, that people and students really learn by doing. Whether it was science projects or being able to touch the car that 50 DPSCD CTE students built or to see Barrington Irving fly in. It was really and opportunity for the students to get up close and personal with STEM and STEAM and understand how it impacts every part of their world, every part of their day,” said Shawn Wilson, multicultural manager of the Ford Motor Company Fund. Each year, the Ford Fund invests over $18 million in scholarships and education initiatives all over the world such as the Ford Blue Oval Scholars, Ford Next Generation Learning, Ford College Community Challenge, Ford Driving Dreams Tour and Ford STEAM Lab. “The Fisher Upper school is actually the new site for the Ford Resource and Engagement Center. Last October or November we announced that Ford would be making a $5 million investment and commitment to that neighborhood and that school specifically by opening up a Ford Resource and Engagement Center which provides students and family with services form basic needs to economic growth to quality of life,” Wilson said. At STEMFest, students participated in over 15 activities created by the Flying Classroom. 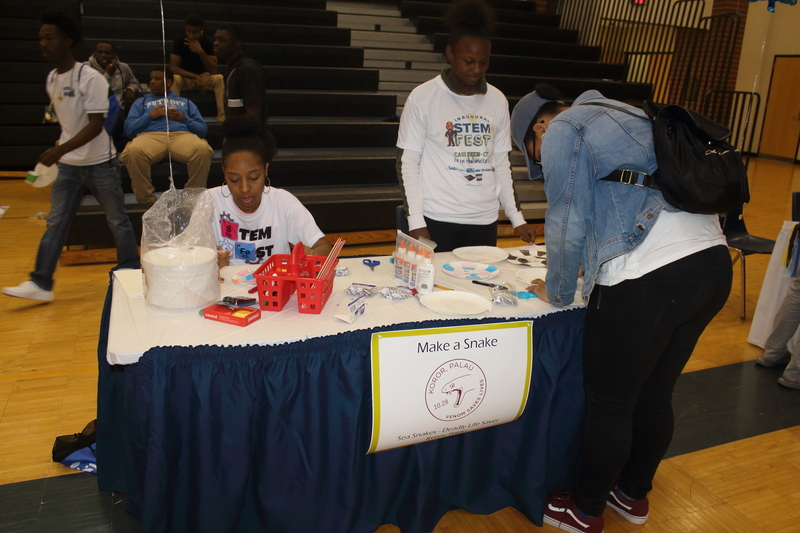 The activities included Build an Igloo, Catapult, Sea Snake, Hoop Plane and more as a way to show students some of the ways they can use STEM to inspire them to participate in the CTE program. Experience Aviation provided instructional support for STEMFest through the principles outlined in Ford’s STEAM Lab digital curriculum. DPSCD’s CTE program provides students with pathways to careers in automotive, business administration, construction trades, culinary arts, drafting/design, technology and more through its courses. STEMFest students were able to see a 1965 Ford Daytona Coupe, designed by Factory Five Racing Inc. and rebuilt by 50 Breithaupt Career and Technical Center students. The car, reassembled over 18 weeks, now features a Ford TK5 transmission, new rear independent suspension, a 306 Ford engine and a 350 horsepower engine through support provided by the Ford Fund. “The instructors and teachers were great and always approachable. I learned a lot and it was much harder than I thought it would be,” said Osiris Mann graduating Breithaup CTE student about his experience rebuilding the Ford Daytona. While Mann will begin pursuing a business degree in the fall, he said, the CTE program taught him valuable skills that he can carry throughout his life. After arriving to STEMFest via helicopter, Captain Barrington Irving, the youngest person to fly a plane around the world solo and founder of Experience Aviation, spoke about the importance of supporting students and encouraging them to study STEM. “The whole point of it is to show the practicality between science and math. So many times we talk to kids and we beat them up rather that just show them what they can do and simulate all these different fun aspects in the realm of science, technology, math, engineering or arts. That’s what we want them so see,” said Irving.